Science fairs. Home of propped up tri-form posterboard and awkwardly placed cutout letters, all announcing scientific breakthroughs that have--let's face it--been announced before. Of course, the real point of many a science fair isn't that a student uncovers something unknown to science but that students uncover things unknown to themselves. 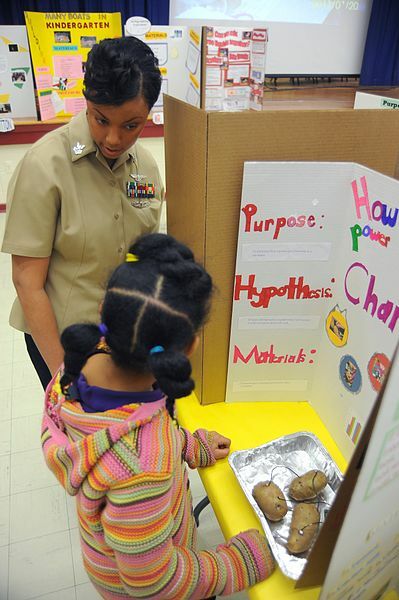 As science fair participants advance in age, the expectation of general novelty increases, but regardless of the age, the whole point of a science fair project is--the science. My son once participated in a science fair. He was six. We ran into the issue of parental involvement in that while we focused on having our son do all of his own work, other parents clearly had not held to that standard. Our son--who has autism--turned in a great poster, all his own, comparing plant and animal cells. He worked incredibly hard on every aspect of it, from finding representative pictures to typing up labels. For references, he told the truth: He had turned to Google and to his mother--me, a scientist--for information. His commentary from the judges focused mostly on how he simply hadn't cited his references very well. Meanwhile, another student whose parents had obviously done his work for him won the ribbon. While that experience was frustrating in the moment, the long-term outcome of it has been positive: Four years later, my son still remembers the differences between plant and animal cells and remains personally invested in the subject, in large part because in doing that work for the science fair, he made it his own. And that's the fundamental thing about events like this: Each student must make the science her own. As hard as it is to keep from getting deeply involved, for the main point of a science fair--learning science--to hit home, the work needs to be the student's. The playing field may not be level because other parents may not adhere to this tenet, but in the long run, I think the science fair participant who does her own work will reap more intrinsic and lasting benefit. With that said, the first step in any project will likely be to turn to online sources for ideas. Here are a few links that will get you started. Three strategies for an original science fair project: Summarized, the strategies are to find directions, find something to measure, and identify an observation. But there is more detail, and as Scientific American guest blogger Maille Lyons notes, the very first-first step is to learn and understand the general method that scientists use for any investigation or exploration. You can follow Maille Lyons on Twitter @ScienceFairInfo and also go to her science-fair-focused Website, where you'll find some excellent advice about do's and don'ts of science fairs. The Library of Congress maintains a page of links to resources about science fairs and science fair projects. Science Buddies maintains a database of science fair projects by topic and grade level. This organization also offers message boards where students can get answers to questions from actual scientists and resources specifically for parents and teachers. USC maintains a listing of science fairs globally, nationally, and regionally and includes a list of virtual science fairs. Happy sciencing. And remember...the goal is to for her to take that science and make it her own. Such a smart post. I run the science fair at my kids' elementary school and I couldn't agree more. I love the handwritten posters and the ideas that clearly came from kids own interests. I do try to honor the parent-helped project (okay, often the dad-did-it project) as at least promoting some parent-kid time at home. I'd be disappointed in any judge critiquing references. We do have judges, but no competition. Just a chance to have 'real scientists'- who are also a school parents - talk to kids about their projects. I coach the judges to find the positive and focused on things learned - even (or especially) if it wasn't what the kids expected to learn.